We began the day having already decided not to stay past noon. We knew the summer sun and hot, empty air would make hanging on after midday very unpleasant. But the July morning was perfect, and so was the weed line at Pool 10 on the upper Mississippi River, the pool the locals call Jay’s Lake. All around us, flat pads and stalk weeds stretched out from shore. We motored across an off-channel cove where the weeds formed a vast, green U. Even in the early hours, the only place we had caught bass had been inside and beside such weeds. The challenge had been working baits through the greenery. As any angler who fishes for bass in summer can attest, weeds are a workout. You cast a lot, you snag a lot, and you tug a lot. Yet, because the bass are in the weeds, it has to be done. The backwaters of the upper Mississippi, north of Prairie du Chen, proved no exception. Early on a bright July day, I usually start out fishing on the surface, above the weeds. A number of weed-friendly topwater baits may be used, but the two I can’t seem to do without are the hollow frog and the solid-body toad. The key to a good hollow frog is for the skin to be pliable enough that when a bass bites down, it gets the hook. I can’t tell you how many hollow frogs I’ve tried with skin so thick and stiff I couldn’t hook the bass that hit them. Despite the strikes, I throw out the bad baits. Toads don’t have as big a problem in that regard, because the hooks are exposed. With a toad, I look for good leg action. Toads have U-shaped back legs that “kick” across the surface. A well-made toad leaves a bubbly V wake even at a moderate retrieval speed. In those thick Upper Mississippi weeds, I used a Sizmic Toad. The important thing when working a surface toad is finding the retrieve that triggers the bass. If it goes too fast, the bait appears unnatural with an exaggerated leg kick that generates too much wake and too many bubbles. On the other hand, if the bait goes too slow, the solid-body sinks, and that is not good, either. With toad or frog, it’s best to hold the rod tip up where you can twitch or jostle the bait as you drag it over the weeds. On this stretch of river, the stalk-type weeds were thick as carrot tops, and as in many similar locations, I noted that a steady retrieve did not trigger strikes. But when I included a series of twitches, jiggling the rod as if suffering the shivers of extreme cold, the bass were much more interested. Hollow frogs are best worked with a pause-and-go action. I like to retrieve so that the frog slides over the edge of a pad weed; then I stop and twitch it without any real forward movement. I also like to drag the frog into an opening, either between stems or next to a large surface leaf, and halt the retrieve momentarily before again twitching it along slowly. Sometimes, when the bass are really hot to trot, I retrieve a hollow frog constantly over the surface. I believe this makes it harder for the fish to identify and reject the fake plastic. Instead, they may take two or three swipes. The more attacks, the more chances for a hook-up. 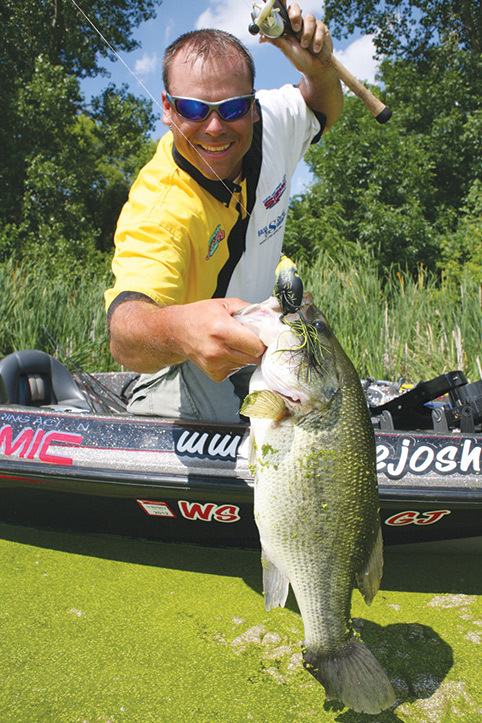 As the summer day brightens, largemouths like to lurk in the core or middle rung of weeds. Within this niche, a bass may move freely back into cover or out alongside an edge. Bass in this mode are probably the most aggressive you’ll find in weeds. They’re on the move because they are looking for a meal. Yet these can be some of the hardest bass to catch, because fish here have a tendency to spook, especially over a shallow bottom. For these mid-level bass, I like to run spinnerbaits close to the edges, relying on short, tight casts parallel to the cover. It’s not as efficient to make longer casts and retrieves that take the bait away from the weed line. A bait working tight to and parallel with the edge will be seen by more bass and attract more interest. To call the bass out, I want a spinnerbait with thumping blades, and the Colorado style offers the most thump. The increased flash of a willow blade is not as important as that rhythmic throb. The standard is a 3/8-ounce spinnerbait with tandem Colorado blades, number 3 and 4, and it’s a great configuration. However, everybody uses it, and the bass on pressured waters can grow indifferent to the action. Fortunately, there is an alternative that gets much less play. While fishing the upper Mississippi, I tried a ploy that I’ve used in the Northeast for a number of years. I went with a smaller spinnerbait, a 1/8-ounce Booyah Micro Pond Magic with a single Colorado blade. The smaller bait offers a less conspicuous profile, yet the Colorado blade still gives out a good thump. I think it “speaks” more like summer food. Certainly, it’s a look that pressured bass don’t see as often. In murky water, I move up to the next size, a 3/16-ounce tandem-blade spinnerbait, in this case a Booyah Pond Magic with number 3 willow and number 0 Colorado blades. It is still a smaller profile with less thump than the 3/8-ounce baits most bass anglers use. Once again, I’m playing upon that difference to catch bass that may be fished a little too hard. Of course, you cannot work even tiny spinnerbaits right through the weeds, certainly not the thick stuff. So, look for travel lanes and small openings where you may run that small spinnerbait, even if no more than a few yards before hitting the greenery. The idea is to do something that other bass anglers might never try. These lanes often exist because the bottom composition changes in a way that is not conducive to the growth of the surrounding weeds. Where this occurs, there’s often a weed edge on both sides of the lane, all the way to the bottom. By running a small-profile spinnerbait through this aisle, you present it to fish looking out from either side. Shallower lanes may be cut by the trolling motors of other boats working the weeds, and I work these, as well. Where a lane goes from the bank out to slightly deeper water, gently flip the spinnerbait tight to the bank or even up on shore. Then “hop” or slide it into the water. The soft entry will spook fewer bass than a cast that splashes down hard in shallow water. It’s also a good idea to add a trailer to the small spinnerbait. I like the 4-inch YUM F2 Boogee Tail, and I bite an inch off the front and then another inch off the back forked tail, being sure to narrow those back cuts down to get the best action. This action matters, but the real key is that the trailer adds buoyancy to the bait, which enables me to better run it in the middle rung of the water column. As the sun rises higher in the sky, bass may drop deeper into the weeds. The descent may be only a foot or two, but it’s like going to the ground floor of a hotel where the air conditioning works better. The way to get after these fish is to root them out with heavy jigs and gangly, buoyant trailers. The bottom composition that supports the most green growth is often soft muck, and the edible creatures that scoot through this muck tend to leave puffs of marl rising behind them. With the right jig, an angler can imitate this right through the heavy weeds. On the Mississippi, I used a 3/8-ounce Bass Stalker with one of the Uncle Josh “meat” trailers, called the Beaver. Shaped like a turkey foot and thick as a slab steak, the Beaver has the buoyancy and volume needed to lift up behind the jig hook. I work it by sliding it along bottom with short hops or long lifts and controlled drops. When it comes in contact with a weed stalk, I almost always am able to slowly pull it over and through. I like the skinless pork chunk because it “lifts” better than most soft plastics. I want the bait tail up, simulating a crawdad’s defensive-posture. This pose, even with a shorter traditional pork chunk (which I believe is misnamed “frog” when it should be “crawdad”) seems to trigger more strikes from the bass. Working a heavy jig with a buoyant trailer this way is maybe the most reliable way to catch weed-bound bass close to bottom. This presentation is best done with braided line that cuts through the underwater stems and leaves with a “weed whacker” effect. Not only is it easier to work the lure, when a big bass does strike and take the line deeper into the greenery, the tension on the braided line helps it cut weeds even better. In fact, I use braided line for all of the weedy presentations, including topwater. No-stretch hook-setting power is always a plus in the slop, and no matter where you hook a big bass, it is going to try to bull down deeper in the weeds. On one cast, I sensed that the bait had shimmied its way into a V-wedge of plant life. I lowered the rod tip about 2 inches, gave it a slight sideways shake, lifted the tip again, and felt the jig pull through. It must have been a foot or so above true bottom, because the loose jig then fell, creating a slight bow of slack in the braided line. As I tightened this line, I felt a tic and set the hook. The weeds erupted in a silvery splash. The angler who attacks the weeds from top to bottom is going to be most successful. Often as not, it’s the only way to catch those summer bass.